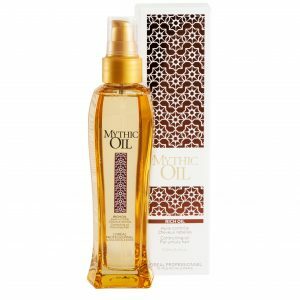 Rich Oil in Mythic Oil Line is a hair care oil for thick, stiff, unruly and frizzing hair. Silicon-oil formula can help condition hair and meet even very specific demands of women. 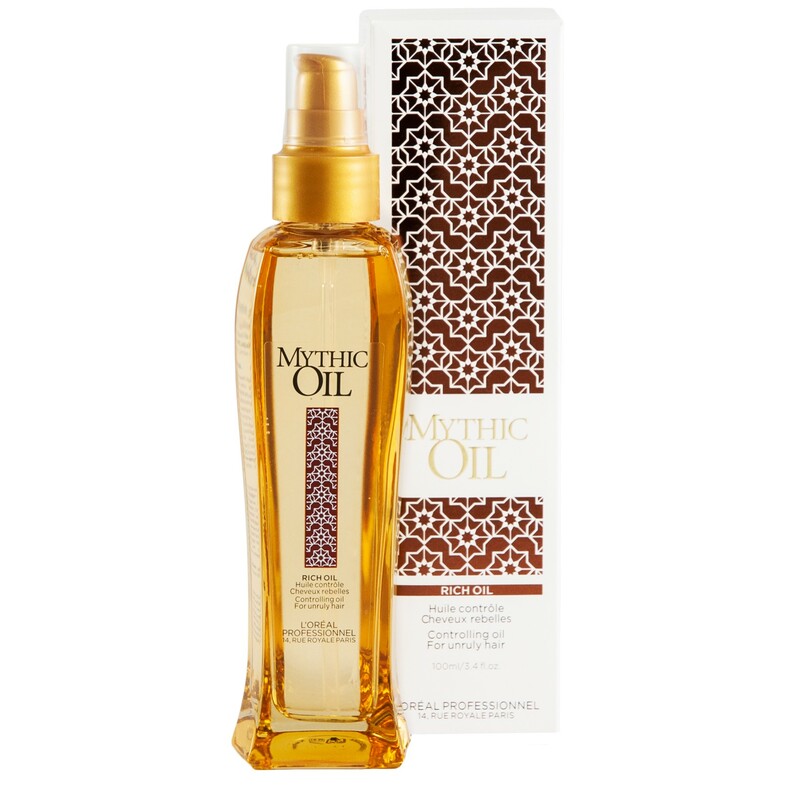 Controlling Oil is one of four oils, that are in L’Oreal Professionnel Mythic Oil Line. This one is dedicated for use directly prior to stylisation. How does Mythic Controlling Oil work? Provides softness, gloss and smoother. Mythic Oil Controlling Oil is based on silicones – first is volatile silicon (Cyclopentasiloxane), and right behind it silicon easy to remove with shampoo (Dimethiconol). Next are emollient and preservative in one (C-12-15 Alkyl Benzoate), which main task is to decrease stickiness of oils in cosmetics. Oils present in L’Oreal Rich Oil are argan oil (Argania Spinosa Kernel Oil) known as a regenerative substance and rice bran oil (Oryza Sativa Bran Oil), with antioxidant properties. Beside these two ingredients there are no other natural substances. Further part of Mythic Oil Rich Oil does not look too good. There are only fragrances (Limonene, Hexyl Cinnamal, Linalool, Butylphenyl Methylpropional, Hydroxycitronellal, Amyl Cinnamal, Geraniol, Isoeugenol, Benzyl Benzoate, Cinnamyl Alcohol, Citronellol, Coumarin) and additional harmful substances. Among them can be found harmful alcohol (Benzyl Alcohol), which can cause dryness, and aromatic alcohol (Cinnamyl Alcohol) which is on the list of 26 potential allergens. For the scent is responsible 12 fragrances, that could be avoided in the oil. Aroma of L’Oreal Mythic Oil Controlling Oil is no surprise. This is scent well-known from hair salons, slightly sweet and very strong. It does not evaporates this quickly, what can be a problem to some people who dislike this type of aroma. Mythic Rich Oil can be bought in glass bottles with 100 ml/3.4 oz volume. This is standard capacity for hair oil, which should last for a long time. Plastic pump significantly makes application of colourless and quite runny oil easier, but also improves its efficiency. The quality does not go hand in hand with solid bottle made of thick glass. The design makes it quite exclusive stylisation product, however it is not about the appearance. The manufacturer recommends two possible methods of use Mythic Rich Oil – on wet or dry hair. Just 2-3 portions of oil massage in hair on their entire hair length and hair ends. The same do on wet and dry hair, but in the second case amount of oil can be smaller to avoid oily scalp and hair. Mythic Controlling Oil can be used during colourisation.